PARK CITY, Utah — New documentary We Are Legion puts an actual human face on Anonymous, the hacktivist group whose members usually are seen wearing Guy Fawkes masks — if they are seen at all. Considering Anonymous’ retaliatory acts against websites run by the Department of Justice and the entertainment industry just last week in response to the government takedown of file-sharing site Megaupload, We Are Legion: The Story of the Hacktivists could almost be mistaken for a 93-minute news segment. But unlike most news segments about the group, the documentary contains genuine moments with actual Anons (some maintain their anonymity in the doc, but others don’t). 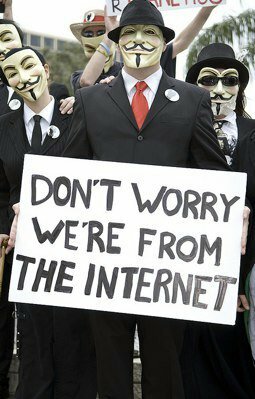 We Are Legion might be the first to portray the group’s members as true revolutionaries, and it could serve as a time capsule if the kind of online sit-ins and retaliatory strikes that Anonymous has helped create become the new model for civil disobedience across the globe. For those who didn’t hear of Anonymous until Occupy Wall Street started up, We Are Legion effectively puts the group’s current incarnation in historical perspective. The documentary traces the roots of early hacker-activist groups like the Cult of the Dead Cow and Electronic Disturbance Theater before jumping into Anonymous’ roots in 4chan. The documentary goes deep. Speaking with current and former Anonymous participants — as well as Wired writers Ryan Singel and Steven Levy — Knappenberger gives a thorough chronological account of Anonymous’ exploits, up to the group’s current place at the forefront of online disobedience. Starting with Mercedes Renee Haefer, who was arrested in conjunction with the denial-of-service attacks against online payment service PayPal last July, the documentary talks to Anons and experts about Anonymous’ vendetta against Scientology, defense of WikiLeaks, and support of the actions in Tunisia and Egypt during the Arab Spring. Slamdance, the underground alternative movie fest that runs during the Sundance Film Festival here each year, seems like the perfect place for We Are Legion‘s primer on Anonymous. The film might have seemed out of place at a glitzy Hollywood-in-the-hills screening. Knappenberger is looking for distribution for his film so it can be seen by a wider audience. It seems possible that Hollywood backers will shy away from a film about Anonymous after the group’s actions against the Motion Picture Association of America and other entertainment industry power players. But Knappenberger said he isn’t worried. He could also take advice from his subject Haefer, who in the film says that what Anonymous ultimately hopes to protect is freedom of speech, regardless of a person’s opinions or background. Anonymous Documentary We Are Legion Peels Back Hacktivist Group's History | Underwire | Wired.com. Over a thousand Occupy Wall Street protesters have gathered in NY’s Union Square late on Wednesday, activists say. This follows a violent crackdown on protesters earlier in the day which left one woman injured and at least one person arrested. The fresh OWS march started from Union Square, spilling into the streets of New York, which the city police were hurriedly trying to block. The Union Square subway station was also closed, organizers said in their live feed, in order to prevent more demonstrators joining the rally. The protests received popular support with people hanging out their windows along the march’s route, banging pots and chanting. Protesters reported taxis honking their horns in a show of solidarity. About 500 police officers barricaded the square, where occupiers were chanting “No justice? No peace!” Still, there have been no immediate reports of arrests. Angered by police brutality towards demonstrators, OWS protesters have announced another rally for March 24, calling for supporters to gather at NYC’s Liberty Square. A large protest rally is also planned for May 1. Organizers are calling on people to skip their work or school and take to the streets to protest against brutal arrests. PROTESTS ARE TAKING place at the former Anglo Irish Bank building in Galway and the bank’s former headquarters in Dublin. Gardaí are currently at the scene outside the building at Dublin’s Stephen’s Green. A garda spokesman told TheJournal.ie that there is a small number of protesters and that it is a peaceful protest. A three-day protest has been planned by Occupy Dame St at the former Anglo building. According to Occupy Dame St, the protest will take place from 7am today until 6pm on Wednesday 25 January, and will involve “music, teach-ins, talk open forum debate and a carnival”. There are currently 11 protesters at the bank in Galway, which is located at the city’s Forster St.
Fia Borg, one of the protesters, said that it was a peaceful protest and that there were no gardaí at the scene. Some of the protesters are from Occupy Galway while others are from the Socialist Workers’ Party. This week, a €1.25 billion payment is due to senior bondholders at the bank formerly known as Anglo Irish Bank, now called the Irish Bank Resolution Corporation. The government has warned that if the payment is not met there could be dire consequences – but trade unions, opposition parties and independent TDs have called on government to default on the payment. The protesters arrived at 8am in Galway at the former Anglo Irish Bank building, said Borg. We have placards and some music going. We are planning to stay there to draw attention to the whole thing. What is happening is immoral. We are trying to stop people from going in. The protesters are trying to prevent people from entering through the front of the building. “Some managed to get in the back way,” said Borg. She added that around 30 to 40 drivers had beeped their horns in support of the protesters and there had been “no negative reaction”. 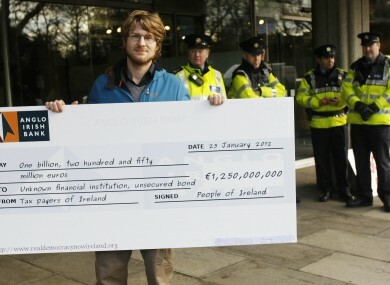 The protesters will return to the bank on the date of the next payment to Anglo bondholders. via Protesters descend on former Anglo Irish Banks in Galway and Dublin · TheJournal.ie.